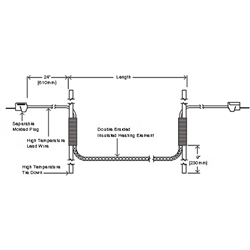 BriskHeat High-temperature heating cords are designed for use on small tubes, vessels, or any application where space is limited and high temperatures are needed. Our heating cords are Extremely flexible and can be wrapped around objects as small as 1/8" (3mm) diameter. Note: Heating cords 12 ft (3.7 m) and longer are equipped with 72” (1.8 m) power leads.